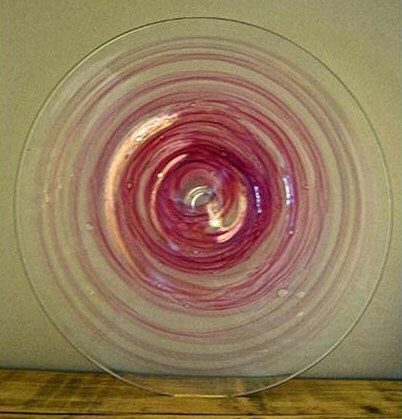 Mauve and white swirled dish, 16 cm diameter, 4.5 cm high, with a coachbolt pontil mark. Made in 1973. Signed on the bottom by Michael Harris. A similar dish in blue and white is in Mark Hill’s book  page 73. This charger is of the same colourway as the dish above. It is 39.5 cm in diameter and has the coachbolt pontil characteristic of late 1973. It is signed Michael Harris, Isle of Wight. 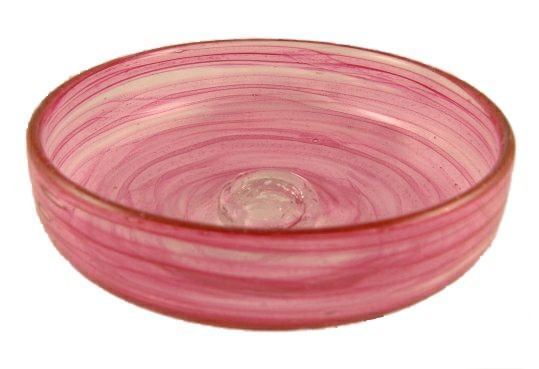 Globe paperweight with pink and white internal swirl with an unusual applied bar foot. Signed "Michael Harris Isle of Wight" on the bar. 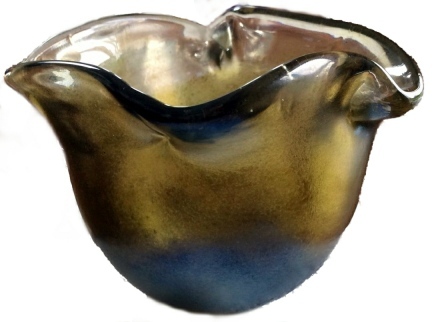 A squat globe vase, 8 cm high and 13 cm diameter, in yellow ochre and blue colours similar or identical to Mdina Rosenthal. There is a flame pontil mark on the base similar to the very earliest use of the mark. 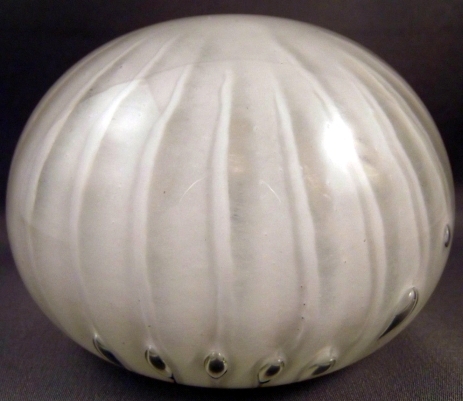 The mark is impressed into a fairly large blob of glass placed in a depression to allow the vase to lie on a flat surface, suggesting manufacture in 1974. It is possible this piece was made using coloured glasses taken from Malta in 1972. 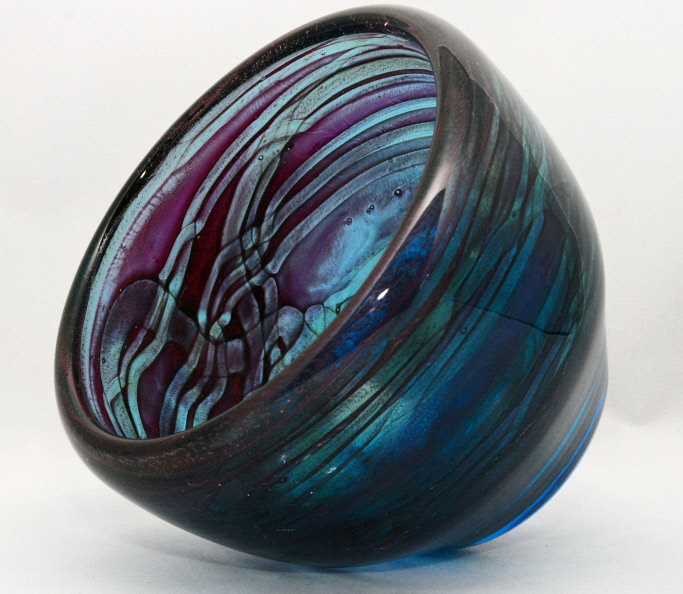 This lollipop vase is 11.5 cm in diameter and 15 cm high. It was made between 1974 and 1980, and is similar to one illustrated in Mark Hill’s book  page 61. 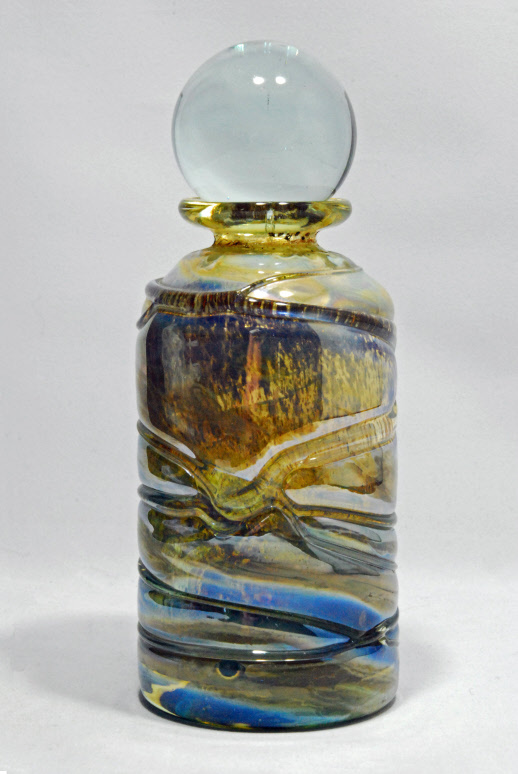 This mould blown stoppered bottle with applied strapping and flame pontil mark was made c. 1975. The design is usually called Strapped Aurene. It is 16 cm high. Please refer to the illustration on page 56 and also page 139 of Mark Hill's book . The latter page reference gives the piece code M1. 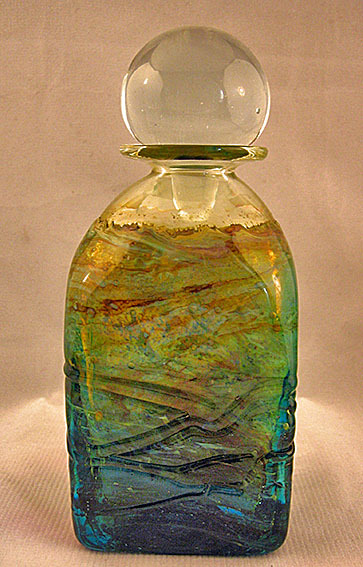 Strapped Aurene cylindrical bottle, 15.6 cm high with stopper. Image courtesy of Mike Collinson. 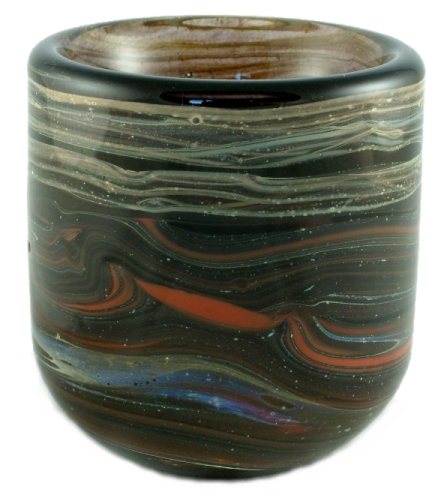 Strapped Aurene cylinder vase, 18.6 cm high, 6.5 cm diameter. Image courtesy of Mike Collinson. 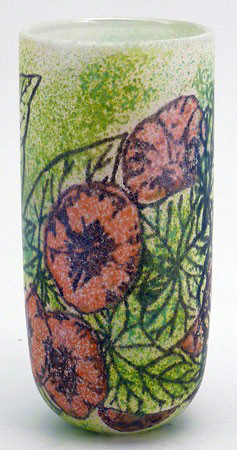 Bottle probably made in the 1970s of an unknown pattern; possibly a test piece. It has the flame pontil mark. It is 13.0 cm high and 6.2 cm in diameter. Image courtesy of Mike Collinson. Experimental bowl, 8.7 cm high, with flame pontil on the base. The base has been ground down but not polished and that dates the bowl to late 1973/early 1974 and must have been one of the earliest items to have a flame pontil mark. Image courtesy of Mike Collinson. 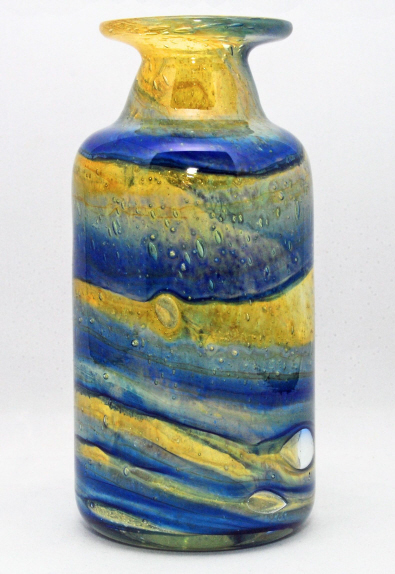 Orange swirls attenuated bottle, 47.3 cm high, 8.7 cm diameter, with a flame paper label on the side and a HANDMADE ISLE OF WIGHT label on the base. Image courtesy of Mike Collinson. 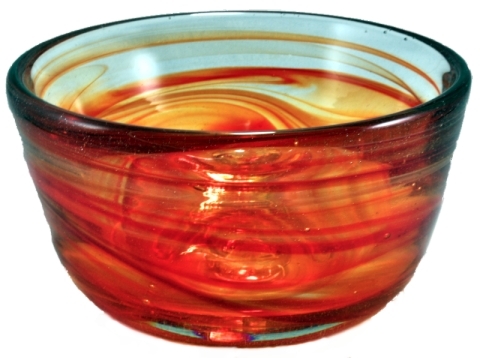 Experimental orange swirls bowl, 8.6 cm high, 15.6 cm diameter, with a coachbolt prunt on the base, dating it to late 1973. Image courtesy of Mike Collinson. 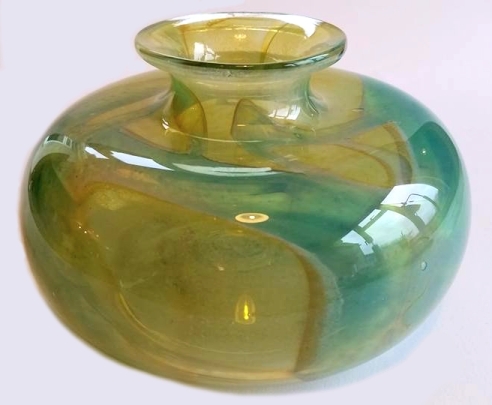 Both the attenuated bottle and bowl immediately above seem to be in the same colourway as a globe vase illustrated on page 72 of Mark Hill's book . Trial stoppered bottle probably from the 1970s, 18.8 cm tall with stopper and 6.4 cm in diameter. It has a flame prunt. Image courtesy of Mike Collinson. 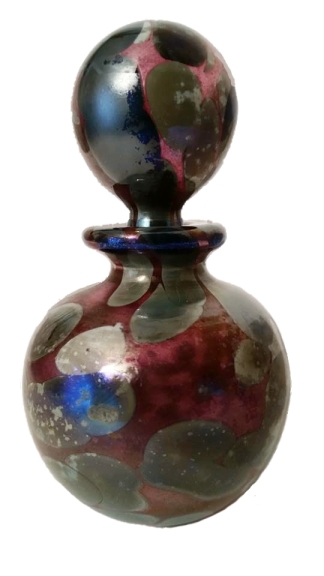 This perfume bottle is probably one of the earliest pieces made by Timothy Harris in the early 1980s. Unusually, it is signed T Harris I.O.W., whereas normally Timothy does not abbreviate his name. Image courtesy of Andy Dodridge. 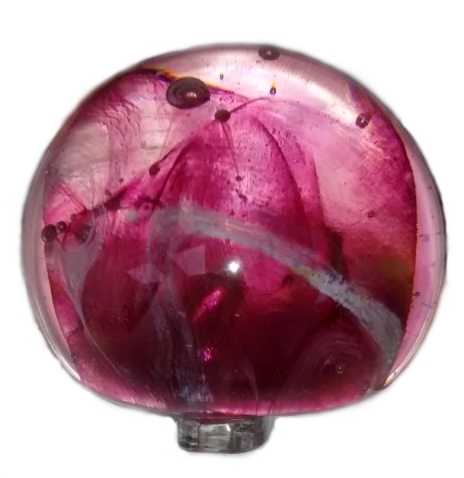 An unusual paperweight reminiscent of a doorknob. 7.6 cm diameter, 7.6 cm high. It has a triangular label on the base. Therefore, probably made in the 1980s. 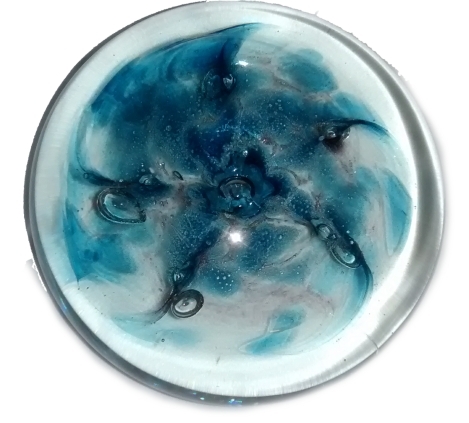 Magnum-sized paperweight with white trails and controlled bubbles at base, 6 cm tall, 9.5 cm diameter. Probably made in the 1980s since it has the triangular label. 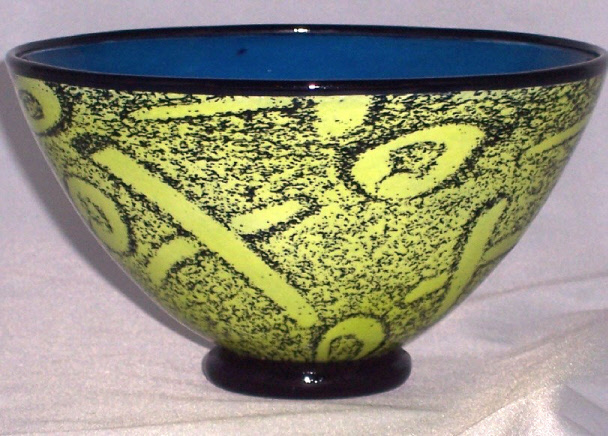 Blue bowl with white spots with six pulled points on the rim, 18 cm diameter and 8 cm high. Probably made mid-1980s. The glass is unusually light for its size and not typical of IOWSG, but there is a triangular label on the side. 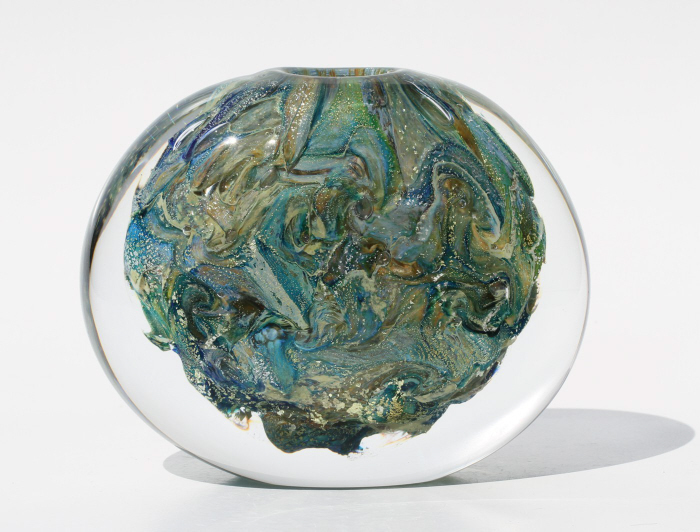 A flattened globe paperweight, 10 cm diameter x 5 cm high, made in the 1980s. This footed bowl is 15 cm in diameter and 8 cm high. It has been given the name 'Oleander', but the origin of the name is not known. It is signed to the base "Timothy Harris Isle of Wight Glass England '96", but the bowl was actually made in 1991. 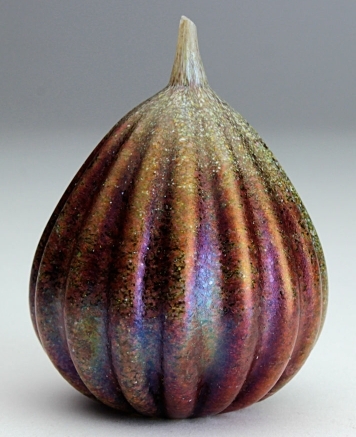 This oval-shaped vase uses the crizzle technique and is 15 cm tall and 15 cm in diameter at its widest point. The rim is ground down flat, which is unusual. The label indicates it was probably made about 1992-1993. Trial heavy pot, 8 cm high, possibly made in the early 1990s. The colour combination of browns with bright red and blue is similar to Dayscape produced in 1992. This pot was released from the IOWSG archives in December 2010. There are no marks or labels on the piece. 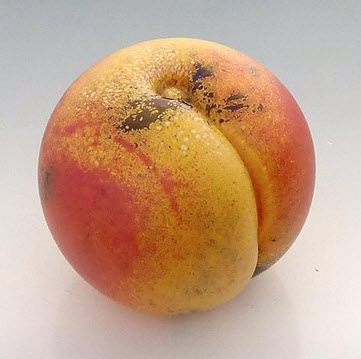 A paperweight made in the shape of a peach. It has a label indicating it was made around 1993. It is also known in frosted glass. This paperweight was a gift to a friend by Michael Harris around 1990. Height 6.5 cm and 5 cm maximum diameter. This unusual pot is reminiscent of Jazz but in a white and blue pattern. It is 18 cm tall and 12 cm wide. 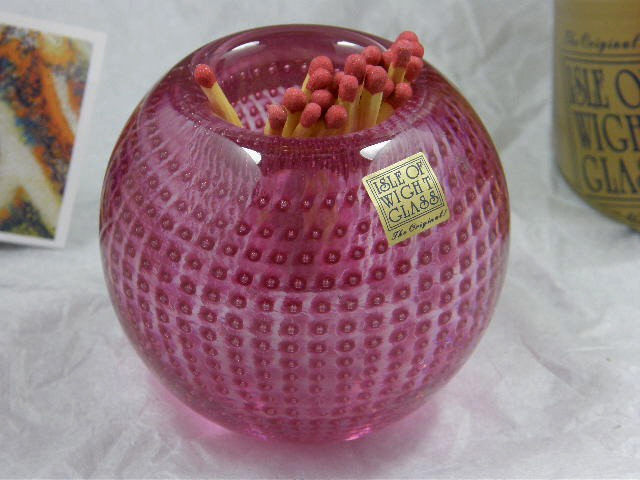 The label on the base indicates it was made in the early 1990s. 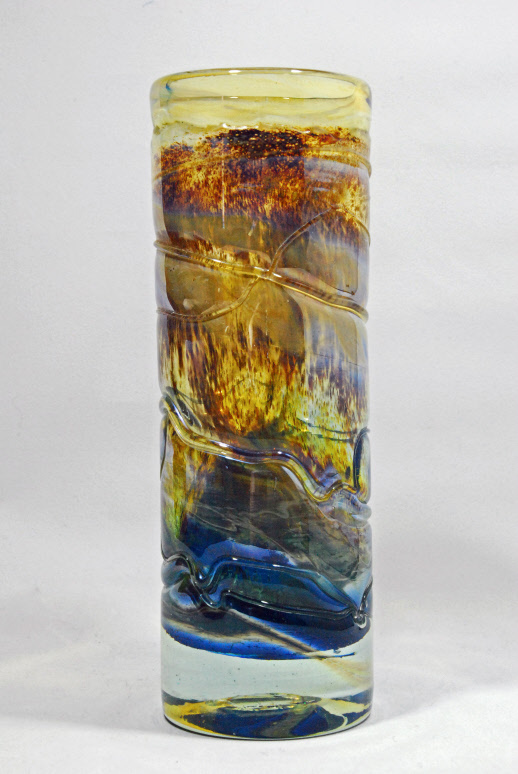 This experimental flower pattern vase was released from the studio archives in December 2010. It is signed and designed by Timothy Harris and was made in 1991. It is 19 cm high. 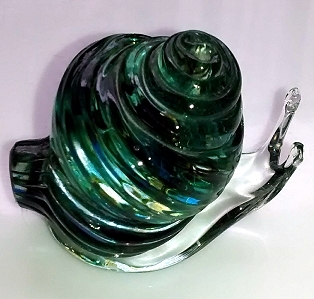 A snail paperweight probably made around 1992-1993. It is about 5.5 cm long and 4.5 cm high. 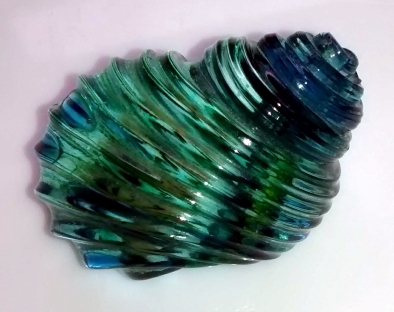 Shell paperweight made sometime between 1992 and 1995. It is about 5.5 cm long and 3.5 cm high. 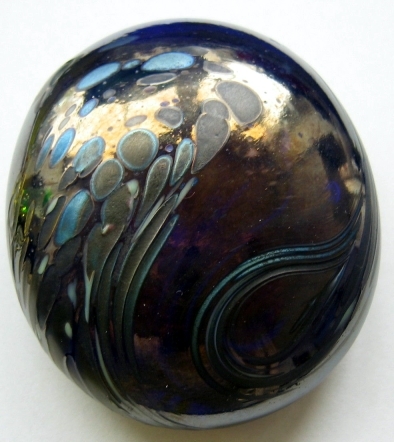 Pebble paperweight with dark blue iridescence. 8.5 cm x 7 cm x 2 cm. Made early 1990s. Trial bowl with pulled edges, 8 cm high x 10.5 cm long x 9 cm wide. Said to have been originally purchased from the studio shop in the late 1990s. 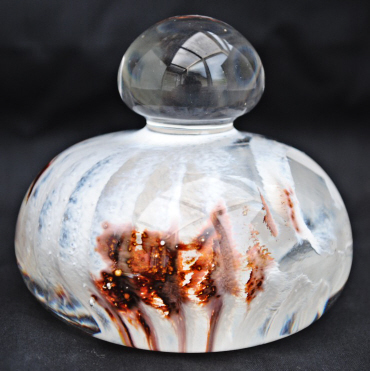 Vesta holder/paperweight with controlled bubbles. Approximately 7.45 cm in diameter x 6.6 cm tall, with the recess 3.2 cm in diameter and 3.3 cm deep. It weighs about 0.5 kg. Image courtesy of www.billtrev.com. 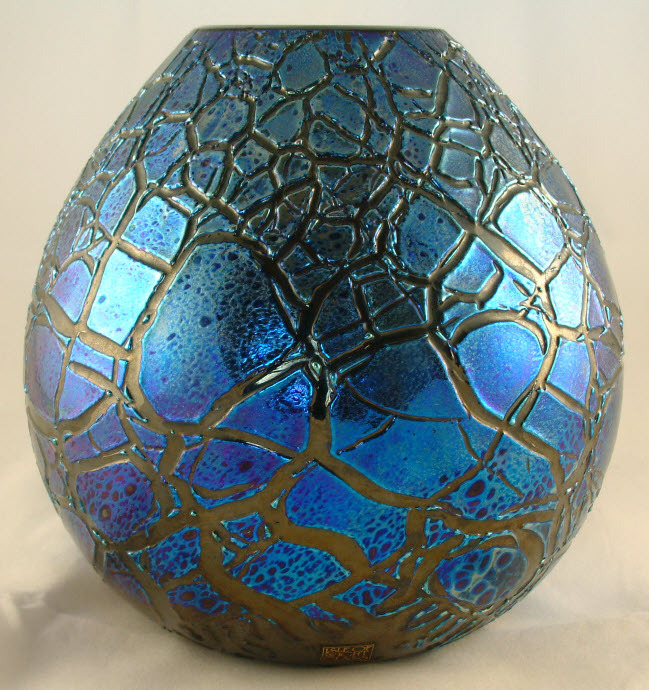 Oviform vase signed "Timothy Harris Isle of Wight Glass 2008". This piece is numbered No.1. It is 12cm wide x 10cm tall. 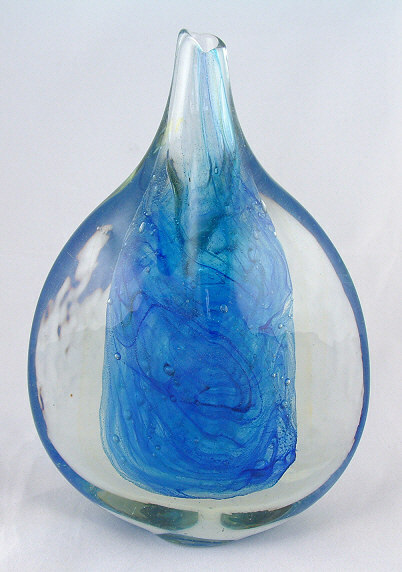 Picture courtesy of Jonathan and Alison Harris of Jonathan Harris Studio Glass. 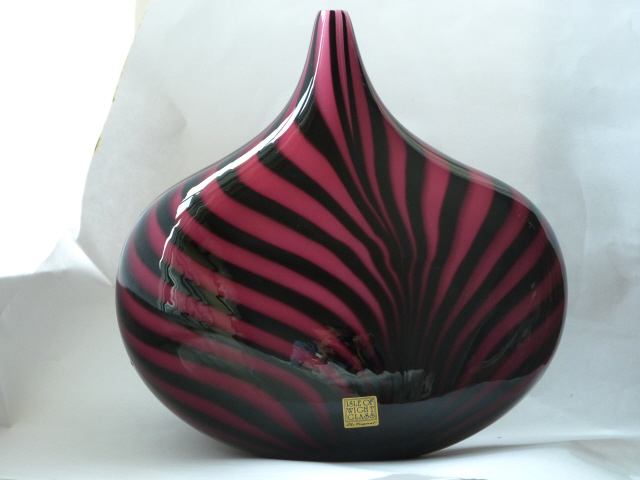 One-off strapped lollipop vase, signed by Timothy Harris 2008 No.1. It is 14.5 cm wide x 7.5 cm deep x 26 cm tall. Picture courtesy of Jonathan and Alison Harris of Jonathan Harris Studio Glass. This was a special commission, signed on the base "Timothy Harris Isle of Wight Glass England". 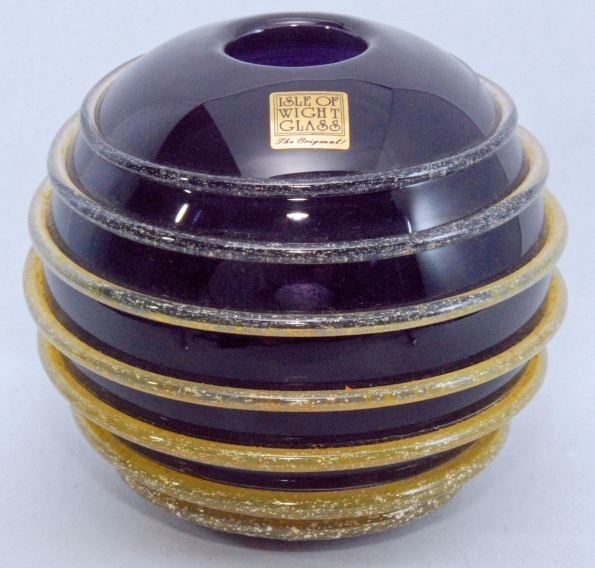 The globe vase is a deep purple with a yellow spiral trail, 9.3 cm high and 10.3 cm in diameter. Tim said its date of manufacture was around 2009, but he was not certain. Apparently, the original customer wanted glass finials on the end of curtain rods and then asked Tim if he would make matching vases. Tim did not say if any were delivered, but there is at least one other vase of this design. Image courtesy of Mike Collinson. 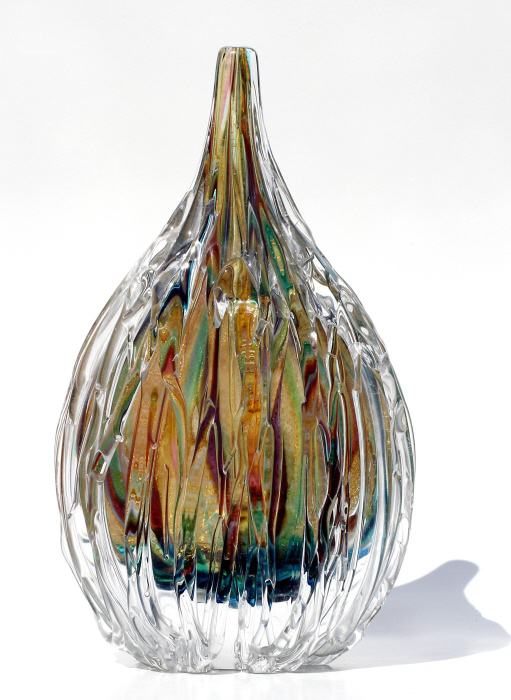 This lollipop vase was made as a special commission in 2012 by Timothy Harris. It is 18 cm tall and 19 cm wide. The signature says 'Timothy Harris Isle of Wight Glass England 2012'. 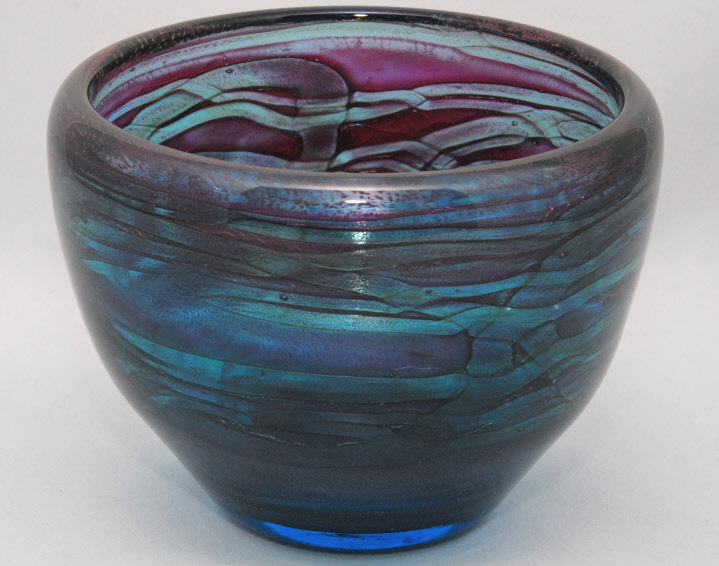 Pictures of this vase being made are on the About IOWSG page. Image courtesy of Mike Collinson.